Where to begin? And yet another beautiful day. We have had nothing less than exquisite weather this entire trip to date. I was sad to leave el Rancho this morning yet eager to commence the next leg of the journey to Patzcuaro. I won’t go on my litter rant. If you want to know more about my feelings on the matter, read any other post I’ve written while in Mexico. Patzcuaro is a neat little town. 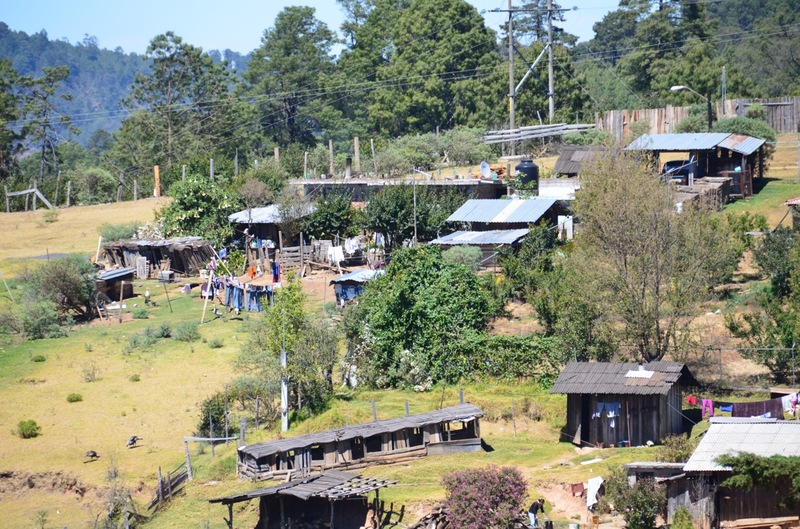 It’s a preserved colonial pueblo in the heart of what is called the Michoacán Highlands. 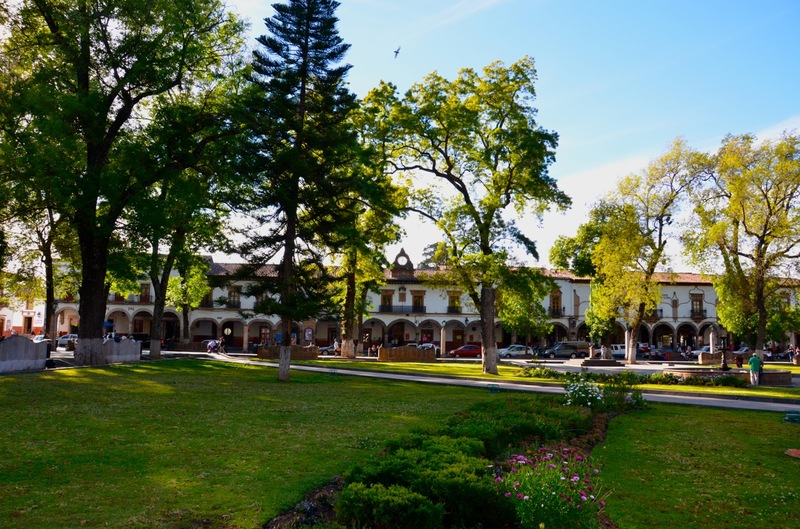 Cobblestone streets, adobe houses with tile roofs, and an unending supply of local crafts makeup this comfortable pueblo. Currently, with about 17,000 residents, its original founding was in the early 1300’s as the capital of the Tarascan state and later the Tarascan ceremonial center. According to Wikipedia, there are several possibilities as to the meaning of “Pátzcuaro.” The first is from “phascuaro” which means place dyed in black, or from patatzecuaro, which means place of foundations, another is from petatzimícuaro meaning place of bullrushes, and still others state that it means happy place or seat of temples. 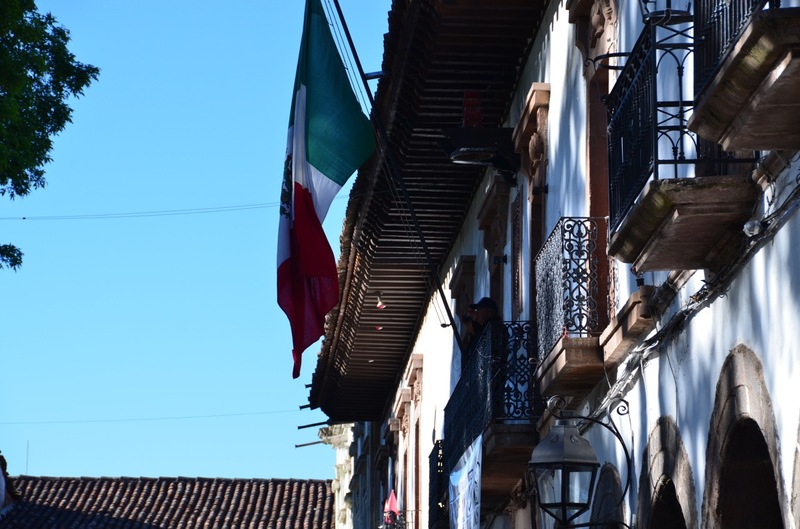 Maintaining its original character, Patzcuaro is known as the Pueblo Magico and has been named one of the 100 World Treasure Cities by the United Nations. It’s very well known in Mexico for holding the most killer Dia de los Muertos festivities. 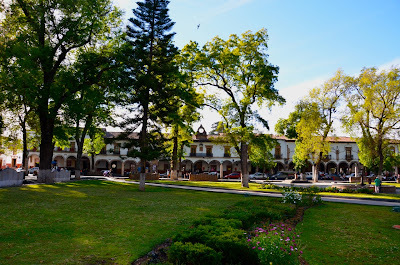 Super clean and with two beautiful plazas, Plaza Vasco de Quiroga (aka Plaza Grande) and Plaza Gertrudis Bocanegra (Plaza Chica), Patzcuaro was an easy transition from the magical Monarcas excursion. Our hotel, Mansion Iturbe Hotel is on Plaza Grande. Centrally located, modest yet beautiful with traditional decor, the Iturbe was a good choice for our first stay in Patzcuaro. Should we have the opportunity to return, we will stay at La Casa Encantada a reasonably priced B&B that specializes in gourmet vegetarian breakfasts – all inclusive. We walked to a small health food store just on the other side of the Plaza Grande to pick up some soy milk for me. The store is owned by a couple – he from Belgium and she from Mexico. I was speaking French to him given my desire to communicate and my poor Spanish skills. Their baby, Avril, was in a crib adjacent to the cash machine. I was happy to support their store, if even just a little. I also bought some homemade chocolate (sin leche de vaca) and cinnamon, which was so dense and decadent that my purchase felt criminal. Si tu puedes me preguntar en Ingles, lo voy a comprar. If you can ask me in English, I will buy it. It took me a while to figure out that sentence, and thrills me to know I can actually form complete sentences. This must be how 3-year olds feel on a daily basis. In actuality, I would’ve purchased their goods anyway, but they didn’t return. While enjoying a beverage at one of the many local cafés, numerous vendors approached us, of course. I couldn’t resist the old woman who was selling woven ranas for 5 pesos. I now am the proud owner of a small woven straw frog. The hotel Hotel Iturbe continued to grow on me. The room is very small compared to Rancho, but we had a KING bed. Hooray! Very high ceilings and a painting of a cowboy skeleton holding what resembles a chicken. Skeleton cowboy’s finger is in the chicken’s mouth. The Iturbe is about 200 years old and feels like traditional Mexico. Lots of colors, flowers, tile, adobe. Warm and welcoming. 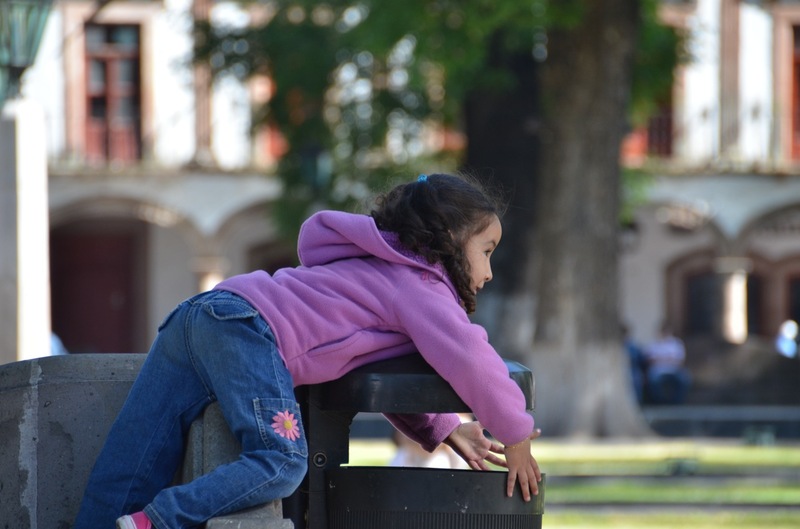 Folks here in Patzcuaro are super friendly, much like what we have experienced in all the places we’ve visited in Mexico. Too bad there’s a state department warning for this part of Mexico, because it is really lovely and tranquil. The hotel room shakes every time a car drives by outside. Curious. Note to self: Never ever ever again order instant oatmeal in Mexico. Two cups of boiled water and packet of dried oats, and the resulting “meal” is a murky soup-like thing with slimy oat parts. The Hotel Iturbe’s breakfast was mediocre at best, and if it weren’t for the fact it were gratis, we would’ve eaten elsewhere. The papaya helped make it a worthwhile use of our teeth and salivary glands. We dropped the laundry off down the block at the local lavanderia and hit the road to Tzintzuntzan. Taking a wrong turn (compliments of my exceptional navigation skills) we headed southwest toward Uruapan instead of southeast – hence the wrong direction. A spontaneous move and two hours later we found ourselves at the guitar village, Paracho. We went directly to Jesus Diaz’s shop, as prescribed by Lonely Planet. Okay. I love J. Jesus Diaz. Small stature, thinning hair, dusty glasses, sitting on a small stool hunched over his latest masterpiece. Sweet face displaying years of living. He tuned and showed three guitars to Scott who played them all multiple times. His wife, daughter, and granddaughter came in. I think his granddaughter wanted to meet us. Only about 3 years old, she came up and shook our hands. Her baby doll, cradle, along with some other simple toys were in the shop scattered about, which added to the sweetness of the scene. I envisioned her playing in there and talking nonstop to her baby while Abuelito was working. We went out for an hour to walk around and discuss the purchase. Stopped off at Victor’s shop where Scott tried a $1000.00 guitar -for kicks and giggles. We passed a place that was making mass tortillas. Scott asked for two, and the smiley lady gave them to us gratis. The were hot off the press and yummy. How sweet is that?Back to the shop and the granddaughter’s baby was wrapped in a blanket sleeping soundly in her crib. It was an emotional moment for Scott to make the purchase. He signed Jesus’ book, everyone joined us, we all shook hands. Given the touching moment, I’m surprised there weren’t hugs and kisses. A mini tortilla factory in the center of town – the lovely woman gave us two for Free! Since we had to drive (kind of) by Lake Zirahuen to get back to Patzcuaro, a side adventure to Miralago Restaurant offered a reasonable alternate route. Miralago was a recommendation made to us by yet another awesome couple, Lea and Ricardo, who we met at Rancho San Cayetano. I call it an adventure, because we really had no idea where we were going or how long it would take to get there. On the other side of the lake rough roads, one being a beautifully paved cobble stone, and a brick road slowly led us around the crystal blue Lago Ziraheun. We followed the signs all the way, and it seems that each one read, “2 km”. Another 2 km. Yet another 2 km. And eventually, we arrived. Greeted by the uber adorable Gabriel, we decided to sit on the back-side patio. Just the two of us and our aperitifs. Listening to the fountain and looking at the lake, the air was fresh and cool. This was a calm place. Peaceful. Gabriel took us inside for dinner. I had a delicious Meditterrean salad – all veggies grown on site (200 hectares) and Pasta with Asparagus. Fresca. We ended the night with a long drive around Plaza Grande looking for a place to park. Patzcuaro rocks on Saturday nights. Strollers of all ages filled the plaza walkway and young people in cars were blasting musico taking the plaza circuit around and around and around. I felt like we were back at the circuit in Chambersburg, PA. Adolescents with nothing better to do (or rather, no better imagination to find something else to do) than drive in circles for hours on end. It’s the restless adolescent’s version of people watching while sitting on a bench, something we older and more tired adults tend to do. We speed-walked back to the lavanderia lady just before 8:00, the time she closed her doors. Tired. Happy. Ready to take on the next day. We’ve been going nonstop. This morning, the plan was to have a slow, lazy morning. At 9:00 sharp we heard a bazaar of brass instruments. Just outside our hotel were marching Federales in the Grand Plaza. We quickly readied ourselves and ran down there in time to see the parade of children. Today is Flag Day, and we were happy participant observers of the festivities! We hung out in the plaza for about 90-minutes watching the celebrations before we took off to Tzintzantzun. Breakfast for Scott was a churro (he bought one off of a street guy) which really is just sugar fried bread, and I indulged in the super dark chocolate cookie purchased the other day at the healthfood store. The plaza was bustling with children and families. When one of the official speakers told the children they will be off of school tomorrow, there was a booming cheer. I couldn’t resist photographing this adorable basura bin climber. Our drive north to Tzintzuntzan (pronounced seen-soon-sawn) was quite easy compared to yesterday’s drive to Guitarraland. Before arriving at the village, we visited the 12th century Tzintzuntzan Ruin Site. What a fabulous area where those Tarascans set up shop. On a beautiful, rolling hill overlooking the village y Patzcuaro Lago. This felt like a sacred place. 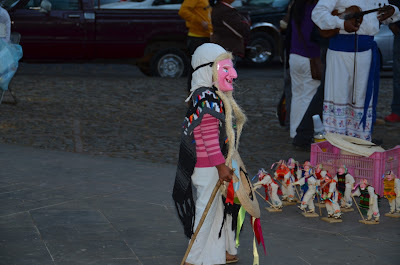 I fell in love with village of Tzintzuntzan. A bright and bustling market filled the plaza between two churches. I bought myself a pretty summer shirt – orange-red (hecho en Mexico) from a friendly vendor. I then couldn’t resist the yarn art made by a local, indigenous group. I bought two pieces having a difficult time deciding between the dozen or so there. And then I picked us up a beautiful wooden spatula – a tool we actually needed. All for about 400 pesos. I went into both churches to light a candle for a friend who is battling breast cancer, but they were the electric candles and that didn’t feel authentic. I mean, turning on a candle? I decided to hold off for a good church in Patzcuaro or San Miguel. Turns out, in Patzcuaro, it was more of the same. I purchased one and “turned it on” and decided I will continue to try until I could actually light a real candle. Whose idea was it to have electric candles in churches that are hundreds of years old? That seems too other worldly for old world. Scott took this awesome photo. See the tree shadow? Bonito. Walking down one dusty street hoping to find a little restaurant, we instead stumbled upon a very colorful shop that sold wood pieces. Only moments earlier, I told Scott how I liked the feel of this place very much. I couldn’t describe it – something in the air? The friendly people? The bright market? Then we entered the open air shop. The owner’s house as a backdrop, and I could see flowers of varied colors peeking through the shop from the house side. Brightly colored crosses and coat hangers – suns, flowers, and hummingbirds filled this store.. I saw hummingbirds – lots of hummingbirds carved into the wood. I decided on a coat hanger with a blue hummingbird. The women mentioned something something “colibri”. Also only moments ago Scott saw the word colibri and we were trying to remember where we saw it last. Morelia? No say. Well, colibri is hummingbird in Spanish. As we learned from the shop owner, Tzintzuntzan is the place of hummingbirds in the P’urhépecha (Purépechas) language. The Purépechas are the indigenous people of this region and are descendants of the Tarascans, an ancient civilization. The P’urhépecha had a god named Tzintzuuquixu, meaning “hummingbird of the south”, which, like the Mexica to Tenochtitlán, was involved in guiding the tribe to the Lake Pátzcuaro area. Thank you Wikipedia. But I digress, literally, that’s what Tzintzuntzan means – place of the hummingbirds. Tzintzuntzan was the capital of the Tarascans before Patzcuaro was the capital (another village, Ihuatzio was the first capital). I got goose bumps when the woman shared that with us. I welled up even. Scott said, “no wonder this place feels so good to you.” Totally. Hummingbirds. That young lad is the craftsperson who made my new colibri coat hanger. We tooled around the town, bought ourselves a mango juego and sat at the small plaza with the two fountains of women holding barrels of water. 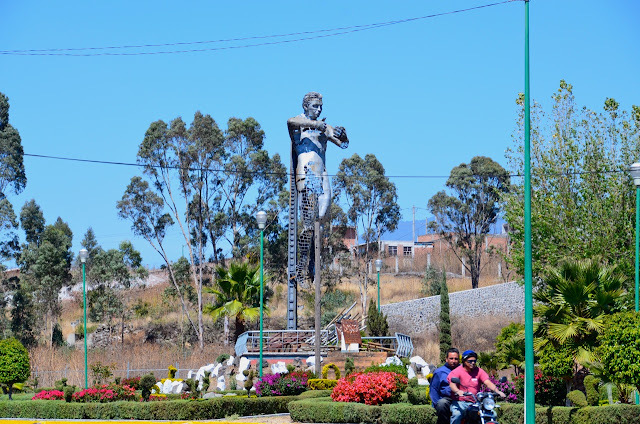 We headed toward Quiroga and upon entering the town drove directly out. Scott was on market overload, and this town was like one ginormous market. It was screaming chaos and never-ending vendor approaches. It was bustling, colorful, loud, and people filled the streets. We maneuvered our way around the calamity and headed back on the road toward Patzcuaro. But instead of going back to P-town we took the lago road in search of a quiet place to grab lunch. We found it there at Café Olla. Sitting outside on the small terrace with the wind blowing the tablecloth and my hair in my face, we soaked in the beauty of the lake and the tranquility of this special place. For under 75 pesos (six dollars), we had a full Mexican meal (huge plate of guacamole anyone?) and cervezas for two. Mi y mi esposo overlooking Lake Patzcuaro. And this is AFTER we ate half the guac! We left Cafė Olla and continued to drive along Patzcuaro Lago passing beautiful rocky, dusty and impoverished villages. Seriously, I’ve never seen so many rocks. Folks here make fences around their farms in rocks. It looks like a civil war battle field. Where do they get all these rocks?! We returned to the hotel just in time for the flag ceremony, again. Brass marching bands echoed as the policia took down the flag. The plaza was packed with people, again. A family of four was entertaining a crowd as Viejo dancers (the viejo thing seems to be very popular). The youngest viejo looked all of five years old. Wearing clog-like shoes, their feet moved faster than the flash dance girl. We strolled one full circle around the plaza. Italian music was playing and we felt as if we were part of a scene from Cinema Paradiso. Lovely. The relativity of money here is curious to me. While we are absolutely pinching pennies in our normal Mexican life and certainly compared to our normal US life, we can’t help but be generous to service providers. And by generous, I mean giving at least a 20% tip to waiters (which is really only about 1-4 dollars on any given meal). Same goes for buskers and old beggars, which are much less common in Sayulita (where vendors prevail) than all of the other towns we’ve seen on this journey. One must remember to add in about 5 dollars a day to give to those folks, assuming one is feeling generous and one has the means. Tonight at the café a boy of 10 came and sang to us- all by himself. He was focused and intent. His voice was rough from singing for what was likely a couple of hours. I gave him 20 pesos. A humble and quiet muchas gracias, followed. He walked away counting his money from the day’s efforts. Just as we were leaving, another kid (maybe 12) and his father arrived. The father playing guitar and the young boy singing. He had an excellent voice and great showmanship, smiley, standing tall and proudly. Patzcuaro seems like a town that is well fed (I mean this sincerely, in a healthy way), but still, there are surely poor folks here too. My overall impression of Patzcuaro, though, as we strolled through the various alleyways and streets is that the residents care about it. Clean, beautiful, ancient architecture, busy cafės. They seem to be doing alright from my perch. And still, I wonder about the old beggars who clearly look poor. How does society help take care of these folks? If the drive time claims to be 1 hour it will be 2. If it claims to be 2, it will be four. And so forth. I think I may have already bestowed this lesson upon you, however, Scott and I appear to be slow learners. Perhaps by writing it down again, I’m simply trying to reteach myself. This morning kicks off the National Week of Health/Semana Nacional de Salud here in Mexico. And yet another reason for a parade. Hoards of gorgeous, jumping, laughing children and folks dressed in doctors coats gathered to watch the flag come down, hands to chest, arms at a 90 degree angle. The little parade walked right by our hotel room as we tidied and packed up. Another parade of children for the Semana de Sante celebration! For breakfast, I ate two cacaburritos and the mandarin we bought in Zitacuaro for 1 peso. Had a bit of melancholy to leave Patzcuaro but eager to see San Miguel as well. We departed at 10:00 sharpish and thought we’d get there by 11:00, which we did (almost) and if it weren’t for a massive parade of protesters on the road to the car rental place in Morelia, we would’ve gotten three by about 11:20. Instead we got there just past noon. We dropped our car off in Morelia, grabbed a limonada and a quick Mexi-bite at our favorite cafe in Jardin de las Rosas then took a taxi to the Morelia bus terminal. We learned from the taxi driver that the Morelia soccer team is called the Morelia Monarcas. Doesn’t sound like a very competitive team, but ya gotta know how tough the Monarchs are to appreciate such a name! Our fourth leg of this journey took us to San Miguel de Allende. A total of 422 pesos or $32.00 US ($16.00 each) for this 3.5 hour bus trip. I hoped the new anti-motionsickness meds (Vontrol) I bought yesterday at the apothecary work. 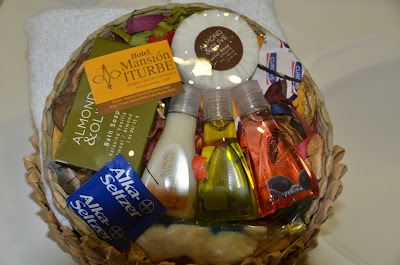 I got myself a little bag just in case.We arrived in San Miguel de Allende about 5:30 after a very easy bus ride. Was it the drugs? The straight road? The 3.5 straight hours of watching Friday Night Lights (which is really like the 90210 of Central Texas)? Hard to say, but I sure was happy about the whole deal. And the bus system here in Mexico has proven itself to be very efficient, stellar really, and quite comfortable. Mexico has a reputation for being disorganized and while we surely see the manifestation of that judgment in various ways such as: folks not maintaining schedules, chaotic loud sounds – in most places, driving on the highways especially in the bigger cities, restaurants (internal miscommunications mostly), hotels (asking a front desk person for our room to not be cleaned and getting it cleaned anyway as one of many examples) and certainly elements of general bureaucracy; there are also very organized aspects of Mexico that impress me. 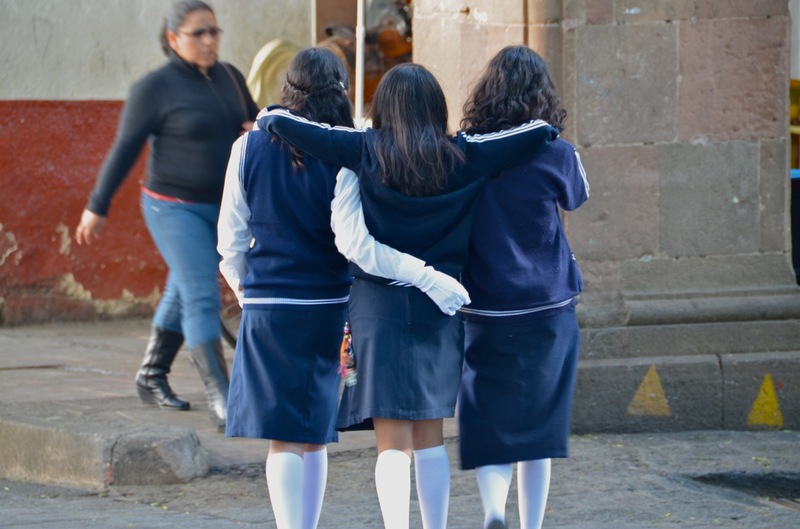 Despite the fact that several Mexican nationals claim Mexico to be the most disorganized country, all one has to do is ride a bus to dismiss the entire notion, because it is exemplary of stellar organization – especially through the national bus lines like Primerplus and ETN. Add to it, most of the pueblos we’ve visited have no street lights or stop signs but instead signs Uno y Uno (one by one). Most folks seem to have no problem with this and sometimes drivers wait for us to cross the street before proceeding (this being a common occurrence in California). Some pueblos have no lights nor any kind of signage, and traffic manages well. And add to that, I’ve never in my life seen a more festive culture where one is sure to happenstance upon a parade on any given day. While the parades here may not appear to be the most tidy examples of celebrations, they occur regularly, which surely requires some organization. Perhaps disorganization is not the best word, perhaps a “relaxed mentality” is more appropriate. We appreciate the relaxed mentality and frankly, we find the lack of rules amusing and refreshing. Don’t drive tired, your family is waiting for you. Increase your velocity, decrease your security. San Miguel de Allende – we’ve arrived! At our hotel, Hotel Real de Minas, we dumped our junk and took the 20-minute trek up to the Jardin by the Cinderella Castle Catedrale. This is my name for it, because it is stunningly beautiful and ornate and looks like a castle to me. The real name is La Parroquia de San Miguel. Gorgeous. Pasta para cena and we very happily fell into bed in our quiet room. *Photos and stuff* Please contact me for permission to use images and text for commercial or private use. Mexico Post #6, Mariposas Monarcas! Mexico Post #10, Back to Sayulita and Jaime Visits! Mexico Post #23, Viva la Independencia!